Two new language services have been launched by the BBC World Service for Igbo and Yoruba speakers in Nigeria and West and Central Africa. Their digital content is mainly aimed at audiences who use mobile phones. Igbo is primarily spoken in south-east Nigeria and Yoruba in the south-west, as well as in Benin and Togo. The new services are part of the World Service's biggest expansion since the 1940s, following a government-funding boost announced in 2016. A famous proverb: "Onye wetara ọjị, wetara ndụ" meaning: "He who brings kola, brings life"
The BBC's expansion in Nigeria - Africa's most populous country where more than 200 languages are spoken - began last year with BBC Pidgin, which targets those who use the regional English-based lingua franca. It is primarily an oral language, without a standard agreed written form. 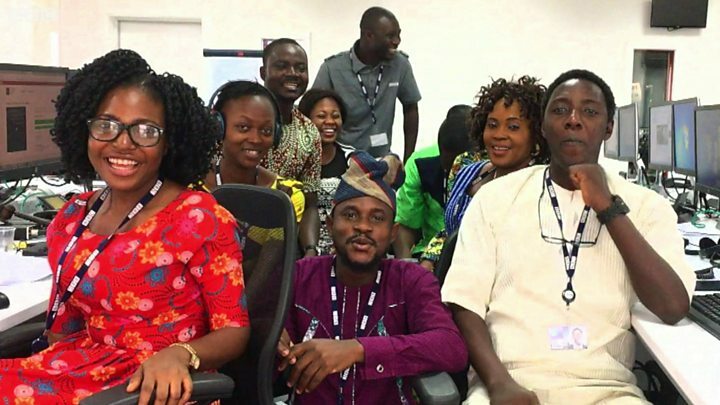 The BBC Igbo and Yoruba teams have also faced challenges to standardise their written languages for modern audiences - and have sought advice from academics. "Yoruba can be very confusing for younger readers because it has so many inflections, so we using a less complex system to appeal to them," says Yoruba service editor Temidayo Olofinsawo. A famous proverb: "Ile laawo k'a to s'ọmọ lorukọ" meaning: "You should name your child to reflect your family background". What's the point of traditional kings? There are very few news publications in Igbo and Yoruba in Nigeria, so it is hoped the new BBC services will be popular with Nigerians at home - and in the diaspora. "This is the first time the Igbo language will be written and broadcast for international consumption," says Adline Okere, editor of the Igbo service. "Igbos are known for their entrepreneurial spirit - and they are spread all over the world," she says. The teams will produce a twice daily bulletin of BBC Minute - an audio round-up of stories as well as news, analysis, explainers and features on the web and social media. The BBC's head of West Africa, Oluwatoyosi Ogunseye, says the focus will be on original journalism. "Delivering content and engaging with the Igbo and Yoruba audiences in their mother tongues is authentic, exciting and refreshing," she says. "We have had BBC Hausa [mainly spoken in northern Nigeria] for decades and we've seen the impact it had with its audience. "When we look at Nigeria we have a multicultural society and the BBC felt that it was very important to give all the cultures a platform to communicate, a platform to interact." Letter from Africa: What’s the point of Nigeria’s traditional kings?